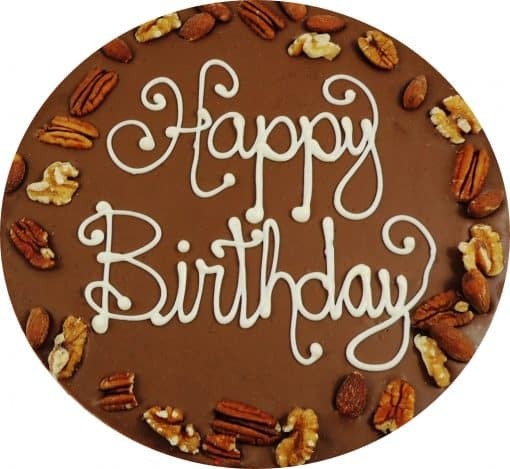 Happy Birthday Chocolate Pizza (regular, 16 oz. or large, 28 oz.) with a candy border makes shopping for unique birthday presents easy. What’s more special than gourmet chocolate blended with homemade English toffee, trimmed in colorful chocolate candy with Happy Birthday scripted in white chocolate? It doesn’t get any cooler than that! Happy Birthday Chocolate Pizza is one of our most popular choices and comes in either milk or dark chocolate. Birthdays are special so make sure your gift is too. Each Happy Birthday Chocolate Pizza is sealed in cellophane and served in a custom pizza box. You can also make it a “Pizza & Wings” Combo by adding our famous Peanut Butter Wings – crisp, rippled potato chips covered in peanut butter and dipped in either milk or dark chocolate. They come in a regular 8 oz size or large 16 oz size and are the perfect complement to our Chocolate Pizza. 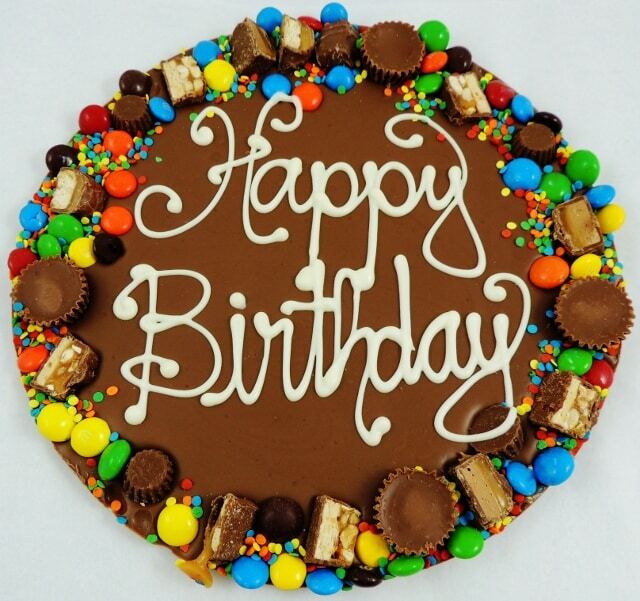 Happy Birthday Chocolate Pizza with a candy border makes shopping for unique birthday presents easy. What’s more special than gourmet chocolate blended with homemade English toffee, trimmed in colorful chocolate candy with Happy Birthday scripted in white chocolate? It doesn’t get any cooler than that! 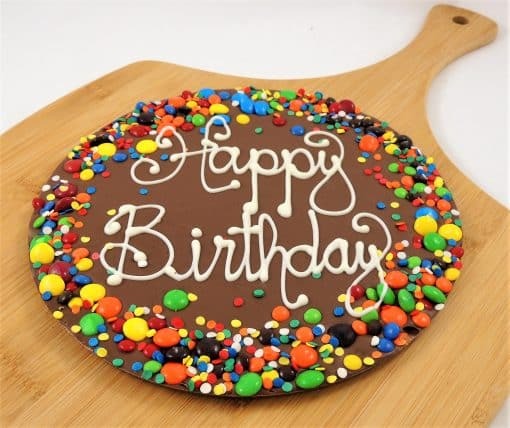 Happy Birthday Chocolate Pizza is one of our most popular choices and comes in either milk or dark chocolate. Birthdays are special so make sure your gift is too. 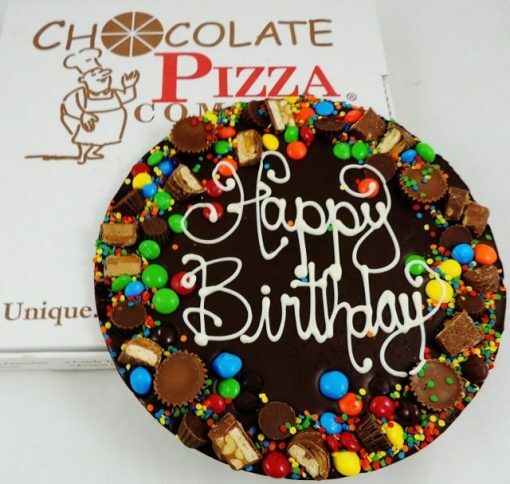 Each Happy Birthday Chocolate Pizza is sealed in cellophane and served in a custom pizza box. 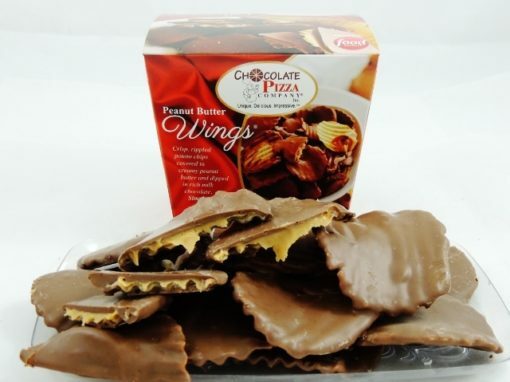 You can also make it a “Pizza & Wings” Combo by adding our famous Peanut Butter Wings – crisp, rippled potato chips covered in peanut butter and dipped in either milk or dark chocolate. They come in a regular 8 oz size or large 16 oz size and are the perfect complement to our Chocolate Pizza. 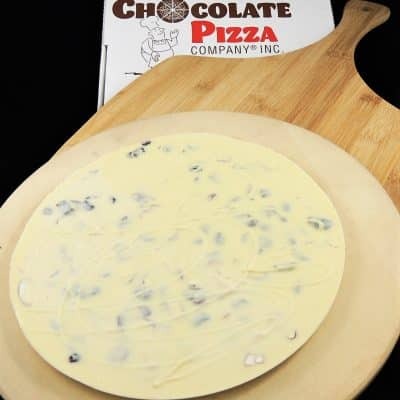 Chocolate Pizza Company has been America’s gold standard of Chocolate Pizza for nearly 3 decades. Featured on Food Network, CNBC, Hallmark Channel, CMT and other major media, our talented team of chocolatiers create this unique confection by blending the highest quality Swiss-style chocolate with homemade English toffee. We hand-decorate each Chocolate Pizza which means you get a unique gift every time. We temper our chocolate which is a very precise process that uses temperature to realign the structure of the chocolate to give it strength, shine and a velvety, melt-in-your-mouth feel. Most mass-produced chocolate candy uses ordinary compound chocolate that is not tempered so the difference in quality between their products and ours is one you taste with every bite. Our English toffee recipe comes from our hometown of Marcellus, New York and dates to 1919. We make it in-house in small batches so we know it is bursting with flavor when we blend it with our chocolate. The toffee adds both texture and taste to our Chocolate Pizza. We do make some of our Chocolate Pizzas without the toffee but it remains a popular – and signature – component of most of the Chocolate Pizzas we produce. Plus, the aroma throughout the entire building is heavenly when we make a toffee batch. Once the toffee is done bubbling away, we cool it on baking sheets, grind it fine and stir it into the tempered chocolate. From there, we scoop it into genuine pizza pans and top each one with a wide variety of nuts or candies. We specialize in customize. 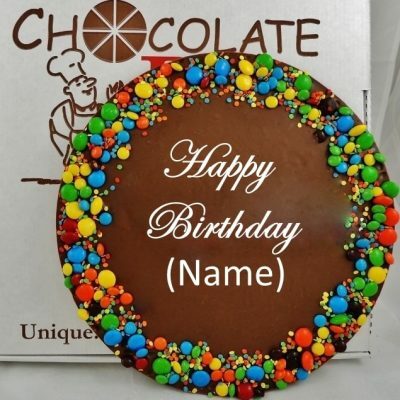 For customers who want to personalize a Chocolate Pizzas for birthdays, holidays, anniversaries or special occasions, we script the words or design by hand using white chocolate. It takes a special talent to do that but it also means the person receives a Chocolate Pizza that was made just for them. We serve our Chocolate Pizza in a custom pizza box. The box has a window that offers a view of the delicious gourmet treat waiting inside and also protects the Chocolate Pizza during shipment. We ship our chocolate confections nationwide and even around the globe with orders coming in from chocolate lovers on 6 continents. Once your Chocolate Pizza arrives, store it out of direct sunlight and in a cool, room temperature location between 55-70 degrees (F). No need to refrigerate or freeze it. Your chocolate stays fresh for months. Above 75 degrees chocolate melts easily so avoid over-handling the product or exposing it to direct sunlight or a warm environment. 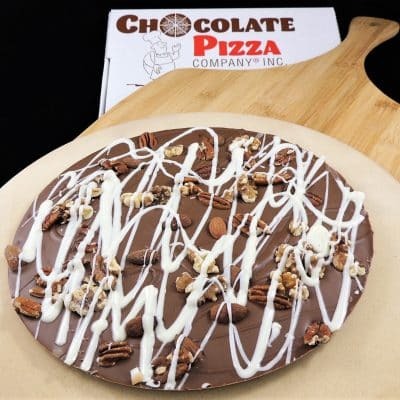 Chocolate Pizza Company makes the only trademarked Chocolate Pizza in America so be wary of impostors. Made in America, we are a family-owned and operated small business that is proud to make the best tasting chocolate gifts that are unique, delicious and impressive. Yes, please add a bow. ($1.00), No, please send without a bow.